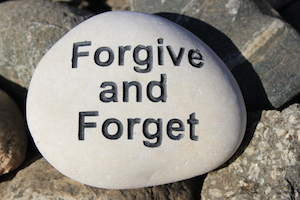 Forgiveness is one of the most important and the most difficult things for us Christians to accept and do. The word of God is filled with examples of the problems that occur when we do not forgive, remember Cain and Abel? how about Ahitophel and David? We also have the good examples of what happens when we do forgive one another such as Jacob and Esau, Joseph and his brothers. I need to forgiveness so I need to follow this example Jesus gave us; we christians all agree that forgiveness is very important. But I would like it to take it a step further and state that we should not only forgive but learn to forget! How can that be you ask? God gave us plenty examples such as in Jeremiah when telling the Israelites of the “New Covenant” to come He says in verse 34, “And they shall teach no more every man his neighbour, and every man his brother, saying, Know the LORD: for they shall all know me, from the least of them unto the greatest of them, saith the LORD: for I will forgive their iniquity, and I will remember their sin no more.” In Psalms 103:12, “As far as the east is from the west, so far hath he removed our transgressions from us.” That’s pretty far isn’t it? But you say how does God do that? Well He chooses to and I believe just as forgiveness is a choice for us, to forget is also a choice we choose to make. A line in Matthew West’s song “Forgiveness” says about forgiveness, “It clears the bitterness away, it can even set a prisoner free, There is no end to what it’s power can do, So, let is go and be amazed, By what you see through eyes of grace, The prisoner that it really frees is you” Unforgiveness can hold us back from being all we can be in Christ Jesus and if left unchecked can destroy our relationship with others and as well as with our Savior. Lets not only forgive but also forget as Jesus has done for us!